Enhancing the Customer Experience by bringing your Products and Services to Life. I was recently wandering through a shopping centre food court in Sydney and almost walked into a pole. What captured my attention was a concept store for healthy eating franchise chain Sumo Salad. The new store, part of a nation-wide refurbishment and rebranding of Sumo Salad, takes experiential marketing to a whole new level. 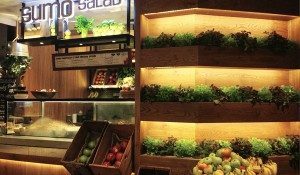 A towering hydroponic wall with fresh vegetables and herbs provides a powerful visual contrast in what is otherwise a typically sterile, fluorescent-lit city food court. Sumo Salad founder and managing director Luke Bayliss says that while the concept of a vertical garden has been a popular trend in urban design for some time now, using them for in-store communication is a new development. Bayliss says the idea is that it provides a visual prompt about health and freshness to people browsing a food court but adds that the greens grown on premises are also incorporated into the product. Apart from providing an immediate and handy supply of ingredients, the store refurbishment program has paid dividends, with the newly designed stores experiencing a 50% increase in sales compared to the non refurbished stores. And it’s easy to see why. After I recovered from the embarrassment of my near miss with the pole, I watched in slight amusement as Sumo customers engaged with the garden while they were waiting for their food, some even picking lettuce off the wall and eating it. Sampling of your product or service. In a competitive environment, you can’t always rely on bright signage. Get your product into the hands of passers by to capture their attention and lure them to your store. Bring a product ingredient or story to life. Build a tower of oranges to communicate a vitamin C product ingredient, build a wall out of clocks to communicate a time-saving brand message or cover your floor in sand to provide a unique in-store experience. Surprise your customers (and potential customers) with the unexpected. Inject some game show fun into customer interactions. American online retailer Zappos did just this late last year at Houston airport, where travellers found their baggage claim conveyor belt festooned with what appeared to be Zappos advertising banners, but were in fact prize markers for clothing, appliances, accessories and gift certificates. The entire conveyor belt had effectively been transformed into a giant roulette wheel, with travelers’ individual pieces of luggage serving as the ball. Zappos staff were on hand to fulfill the prizes and turn a mundane experience for travellers into a lot of fun and for some – a jackpot prize win. Giving your business some wow factor, creating attention and increasing customer engagement isn’t difficult or expensive but it does take some effort and planning, not to mention a healthy dose of creativity. Just make sure any poles in the vicinity are well padded!